CNG: eAuction 428. Festival of Isis. Mid 4th century AD. Æ (15mm, 1.71 g, 12h). Alexandria mint. 428, Lot: 412. Estimate $150. Festival of Isis. Mid 4th century AD. Æ (15mm, 1.71 g, 12h). Alexandria mint. 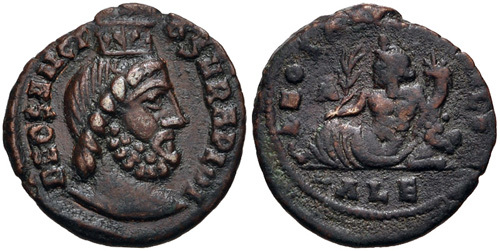 DEO SANCT O SARAPIDI, draped bust of Serapis right, wearing modius / Nilus reclining to right, holding reed and cornucopia; ALE. Vagi 3384. VF, brown and green patina.